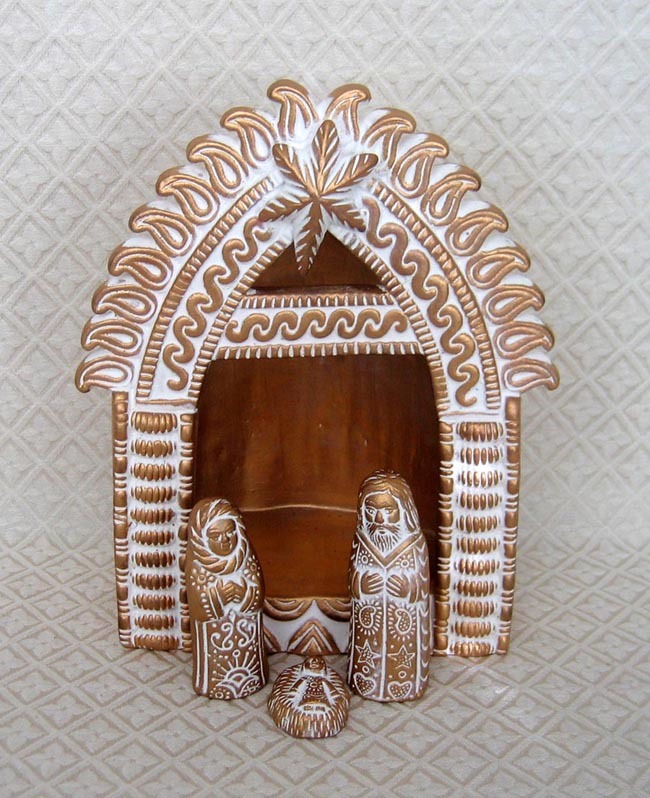 This terra cotta clay Nativity is first whitewashed and then painted with gold paint for accent. The stable is adorned with traditional kolka motifs. Kolka is a folk motif well known in Bangladesh and India’s West Bengal. It also appears in traditional nakshi kantha stitching found on textile items. Three raised leaf branches decorate the back of the stable. The stable measures 9.5 inches tall by 8 inches wide. The Joseph figure measures 4 inches tall. CORR was started in 1973 by CARITAS/Bangladesh, the Catholic Service organization, to give rural women the option of staying home with their children and still earning supplemental income for their families. CORR (Christian Organization for Relief and Rehabilitation), like other Bangladeshi development organizations, was established at the end of the war of partition which divided Pakistan into East (Bangladesh) and West(Pakistan) in 1971. The 4,200 women artisans, who are members of 214 rural cooperatives, produce jute and ceramic products in between household chores and family responsibilities. Fruit and timber saplings are provided to producers to ensure the regeneration of scarce fuel resources and to provide food.